↑ "Aston Martin Automatic Gearboxes". JT Automatics Ltd. Archived from the original on 25 April 2016. 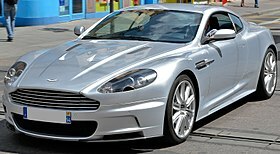 ↑ "Aston Martin to premiere DBS Volante - Canadian Driver". Blackriverpost.com. สืบค้นเมื่อ 2010-09-30. ↑ "Aston Martin DBS Volante - A beautiful idea - Detroit News/LA Times". The Detroit News. สืบค้นเมื่อ 2010-09-30. หน้านี้แก้ไขล่าสุดเมื่อวันที่ 27 ธันวาคม 2561 เวลา 13:42 น.